Where did the nickname Fork come from? Are you really a Dr.? Are Bob, TBP and Bobo actually the same person? Is he called "The Mule" for an appendage or his stubbourness? Send Dr. Dave or Don a message on our Facebook page and we will make every effort to learn it for you! Pepper Street Band's schedule is filling up quickly so don't wait! 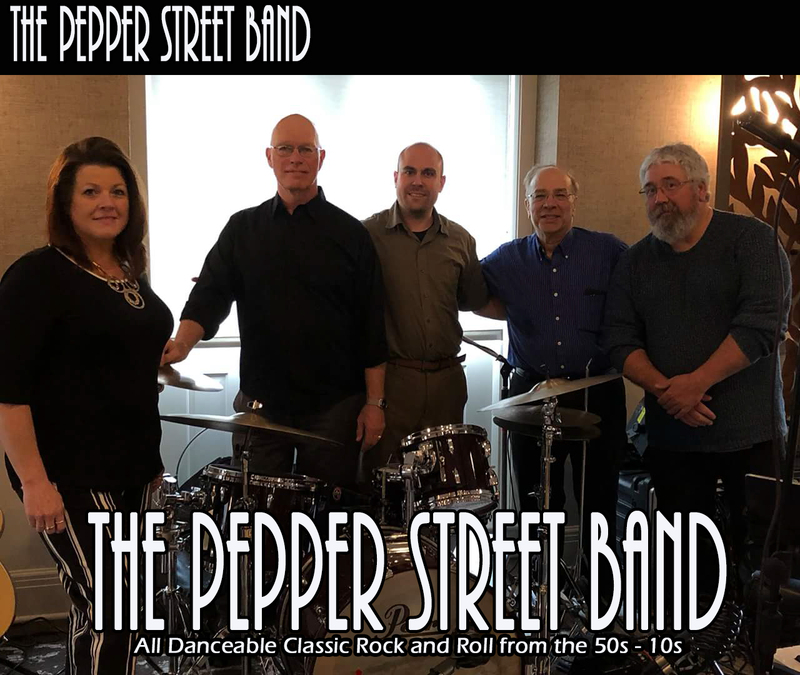 Contact Dr Dave Houseknect or Don Bastian, on Facebook and get Pepper Street Band for your club, establishment or event. I come from a musical back ground. My mother studied concert piano and my father played with his family band. His father and brothers played fiddle and his sister, Mary, could just flat out play anything she heard, using both hands. That was amazing. I would listen to them play a hoot-n-nanny and the music took over my feet and I would "dance like no one was watching." I was in the elementary choir and sang soprano. Seriously! Then I sang in the college chorus for one semester. I played in my 1st band in 7th or 8th grade. Sucked! I knew 4 chords. First gig was at the Muncy Catholic Church basement playing during the break of the "Shades Of Sherry." I'm Not Your Stepping Stone, was our 1st song, and we're still playing it. Good music, as well as good fashion, never go out of style. Forward 15 years, I played in "New Horizons," during the fabulous late 70's and actually learned a little bite about playing guitar with the help of a good friend Andy Wall. He went to Berkley and eventually graduated with a degree in Classical Guitar. In '87 I started my Chiropractic business and stopped playing until 2005. I was asked by my secretary, to play for her wedding. I had played for her mother's wedding about 30 years before. I've been playing ever since and still can't figure out how to play this damn guitar. I endeavor to persevere. Currently a music educator, Rich Cummings is also a trained orchestral percussionist. He enjoys playing in his group Black~N~Blues, a semi-finalist in the International Blues Competition. Along with Black N' Blues, Rich has also performed with local favorites; Sean Farley and the Lynn and Farley 5. He also is a member of the Williamsport Symphony Orchestra and recently joined the Doug McMinn Jazz Quartet. Traditional afro-cuban percussion is not the norm in WIlliamsport Pa, but Mr. Cummings is well versed in that ethnic style of music. Drumset is his area of concentration. He sightreads and enjoys playing all styles of music from funk to jazz, from Pantera to Snoop Dogg. A very eclectic musical individual! Obtaining a degree in music was very important to Mr. Cummings as he was a frequent performer with all the ensembles at Mansfield University. Along with his Bachelor of Science in Music Education with a concentration in percussion, Mr. Cummings seeks out private teachers to further develop his playing and technique. He has attended master classes by Steve Smith (Vital Information, Journey), Peter Erskine, Jim Chapin, Dave Weckl, and Marco Marcinko (Maynard Ferguson). Rich has took this knowledge to cities like New York, Baltimore, Newark, Washington D.C. and Williamsport PA, where he presently resides as an educator and a freelance musician. He recently attended the International Blues Challenge in Memphis TN with his group Black~N~Blues. They have also opened for Blue Oyster Cult. He also accepts calls as a fill in/studio drummer because of his experience as a player in all styles of music. Along with being an avid performer, Rich also is heavily involved in digital recording and Disc Jockey Services with Smooth Sounds. He travels to any live venue and brings the studio to any band that is interested in a live recording on that particular night. Enjoy the many recordings that are available to listen to under the Recordings page. I began my musical career at the age of 8 when I began trumpet lessons from Wilma Finkbiner at the Keefer music store. I turned professional at the age of 14 so I could play with Johnny Miller and the Star Lighters big band and the Repaz marching/concert band. At that time you had to belong to the musicians union if you wanted to get paid for your efforts. I was introduced to music theory by Al Nacinovich, my junior high music teacher. Just before high school graduation in 1966, I auditioned for the US Navy music program and was accepted where I played and/or backed some of the finest musician/acts in the world for four years of active duty. After my active duty period ended, I played with the Bellaires, Ozz, Brothers and Others, Prince Charles and the Royal Tones, Banned Together, and Pepper Street, and performed in various shows – the Chrisman Show and The Uptown Music Collective. Today I belong to the Navy Musicians Association, play in the following groups - Brothers & Others, Banned Together, Pepper Street, and now – The Goombahs! Along the way I learned to play the piano, congas, guitar, bass, drums, and sing. I was influenced by my teachers, all my brothers and sisters that I have been privileged to play with, and the many artists I’ve listened to or backed. I must also say that if I truly have any talent, I may have inherited it from my mother’s father who played clarinet in the Philadelphia orchestra. They say that every record has a flip side – by day I’m a retired computer professional of 40+ years and by night I'm a professional musician. The edge of my records includes three children and six grandchildren. Music has always been a part of my life. My grandmother Yoas tried to teach me to play piano for a number of years. My Uncle, Billy Brucklacher, who was a local musical stud in the 50s and 60s, taught me some guitar chords, but mostly I am self taught. It was around 1976 when I started to seriously get into music. Influenced by The Beatles and Paul McCartney, I began hanging out with boyhood friends, Dave Brumbaugh (UMC founder) and Joel B Vincent (local drum god) and Beau Bodine (Greenhouse, Isle of Q, etc.) Started on guitar, but was eventually drawn to the bass. I've been in a number of local bands, starting with NightRider, then playing country (West End Country Band), Rock (Sue Bloom Band), Motown (Loni Gamble and Sound Cheque), Alternative (Rhythm Face) and currently with Dead Flowerz and Pepper Street. I've been married to the same wonderfully tolerant wife, Jennifer, since 1984 and we have 1 daughter, 2 talented granddaughters. Rian, who is taking vocal lessons at the UMC, and Cadence, who is taking private piano lessons. We also have two SPCA rescued dogs, Molly and Penny Laine, who keep us quite busy. Music was an early influence in my life. My Mom (rest her soul) she was in to the Columbia record mail-order thing, Motown was a favorite of her’s. She would have us kids play those 33's over and over, then Elvis and Stevie Wonder came in the mail and just like and teenage girl I was in my bedroom with hair brush in hand singing in front of the mirror. Church was another musical outlet as was also the high school choir. Our church had a puppet ministry and we would travel to nursing homes and festivals putting on shows. I so wanted to be a puppeteer but my group leader wanted me out front singing and getting the people to join in on songs, I guess he saw something promising in me. Fast-forward to 2017, I have been employed by Susquehanna health as a Hospice home health aid for about 18 years. So I'm on a job and I can't get over this feeling of knowing my patient from the past. Well wouldn't ya’ know she went to the same church that I did when I was a child. Her husband Danny would always be playing guitar in the living room and would call me in to sing a song with him. At that time he was going to nursing homes playing small gigs and decided to invite me along to sing. That turned into “Danny and Sandy Live” we played several venues around the area, August 2016 being the last gig for us. Danny Kimball taught me so much about music. I wanted more, so I put my name out there and soon, Craig Waltman (local drummer) called me, along with Doug Sherri (guitar), and Stu Rennick (bassist), they were looking for a singer for a project they were working on. We played a few gigs but never got off the ground. I do have to give props to these guys as they taught me how to sing with a band I knew nothing when I joined and I told them that I was self taught. That was the Mr. Green Jeans Band. So forward to another project; Susquehanna Sunset with Craig, Doug, myself and two new musicians Dwane Dulk, and Jeremy DePrisco. We only played a few gigs and found out the chemistry just wasn't there, but yet again I have to thank all the musicians I have played with you have taught me so much I thank you all. Last June 2016 I got a guitar for my birthday (thank you Walt), and I play every chance I get. Walt Davis III taught me my first chords and I was hooked . I now have about 30+ songs in my library. I met the guys of Pepper Street while I was out singing Karaoke and I was even a “Pepperette” for awhile. Now our paths have crossed again, I feel a great chemistry with these guys and we have a lot of fun. There are two things that you can count on when we go out to play many places. Do you do Gimme Three Steps and WHERE'S LUCY?! Lucy is Dave's mistress bulldog and she definitely runs the show. Kick Drum is one of her favorite (not) instruments and she shows her appreciation by incessantly vocalizing with the beat! Everyone loves this bundle of TNT, and she regularly reaps the benefits from the clubs with kitchens. On March 07 of 2014 Pepper Street lost a long time member of the band Rick Martin. Rick sadly passed away from complications of diabetes and lung cancer quite unexpectedly. He left behind a his beloved wife, Sharon and a daughter, Jenna. His smile, irreverent humor and friendship will be remembered and missed by his fellow bandmates, as well as anyone that had the honor and privilege to meet him. In addition to his drumming skills, Rick was an accomplished drag racer, engine mechanic and train enthusiast. We miss you Tundar! RIP. The supreme master alpha bulldog! Norm brought new meaning to the word alpha. He also loved the drums (not) and could snore through the loudest song we could play. We all miss Norm.